As I type this, there is something momentous happening to the far north of us. A silent annual gathering has begun, in anticipation of a crucial event. The ocean water in Hudson Bay is freezing, little by little, creating islands and bridges made of ice that will stretch into a dark and vast arctic ocean. This is the ice, once formed, that will provide hungry polar bears access to the hunting grounds where the seals that they depend on live and breed. 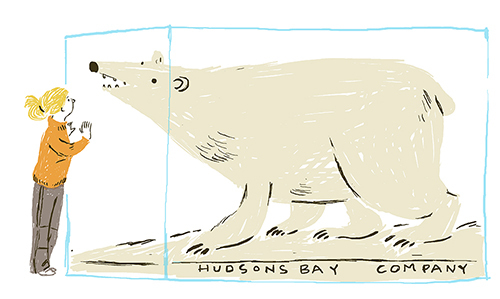 At this very moment, bears and their young are gathering around the edge of the bay, waiting and watching. Each year, the wait becomes a little longer. 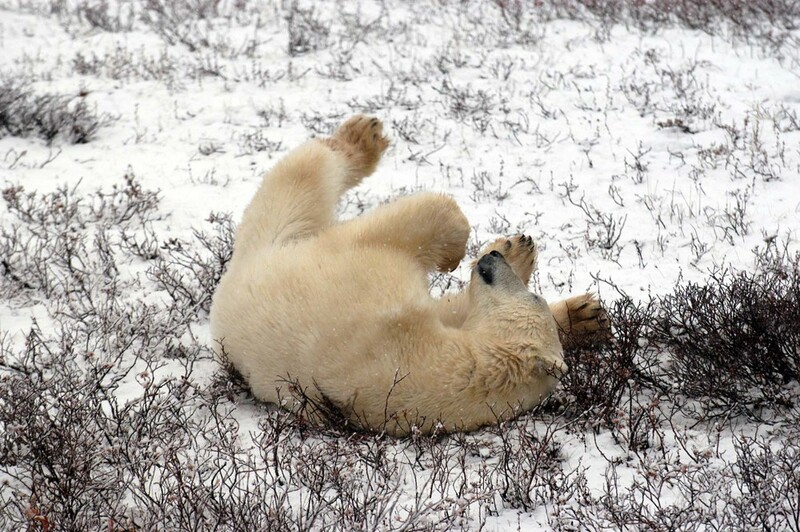 Polar bears have become the icon of global warming, facing head-on the realities of a changing climate and its effect on their survival . 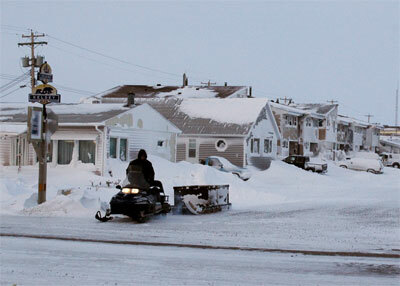 Churchill, an outpost of a town that clings to the edge of Hudson Bay, has become their front line. Obviously, bears themselves can do little to change the fact that our planet is getting warmer, and must depend on the human advocates whose mission it is to protect these animals and their habitats. I was blessed last year to spend a few days with these heroic souls when I was invited to visit Churchill and its surrounding tundra, sketching and studying polar bears in their natural state. The invitation came from my brave and dear friend, Leeann. Leeann, like many of the people I would meet in Churchill, first visited the bears as a tourist a few years ago, and was so moved by her experience that she joined Polar Bears International, an all-volunteer organization dedicated to conservation through research and education, lending her abilities as a writer and speaker. PBI was my host while in Churchill, which meant that I was able to spend lots of time with Robert Buchanan, its Board President. Robert is a fascinating and perhaps unlikely hero to these bears, whom he came to love after visiting the region annually for more than two decades of arctic photo safaris that inspired him to dedicate his retirement (he was a successful marketing/finance guy) and ample connections and resources protecting. Watching Robert in action, I realized quickly that he is the one, in this diverse community, who brings everyone together. He could swap stories about vodka and near-death with the burly drivers and seasoned guides, and minutes later, he could offer technical guidance to a twenty-something with questions about the northern lights. Later in the trip I watched him smooth over what could have been a mutinous moment involving a visitor who was angry that the bears we were watching were not willing to get up from their nap to give her a few glamour shots. "She doesn't get out of bed for less than ten thousand", was his dry response to her complaints. In a place and a time when so much is at stake, where views are extreme and politics often threaten progress, he is the perfect affable ambassador. Robert drove me through town on my first morning in Churchill, past a new but uneven row of townhouses that looked as though the ground beneath them had buckled in an effort to shake the buildings from their base. The ground, he explained, was thawing out for the first time in our human history. Until recently, houses in Churchill did not require foundations, they could be built directly on the long-frozen earth. Points just north of us might still remain in a state of "perma-frost" year round, but suddenly, in Churchill, the ground was softening and expanding. Churchill is only reached via train, ship, or plane, its history one of trade and commerce between nations and continents which began long before its settling by the Hudson's Bay Company almost three hundred years ago. Its port is still ideally located in terms of bringing goods into North America, when it is not made impassable by ice. Freight can be unloaded here and easily transferred to trains that then carry cargo south, where it joins a vast shipping and rail network far into Central America, while avoiding US ports and their prohibitive rules and tolls. 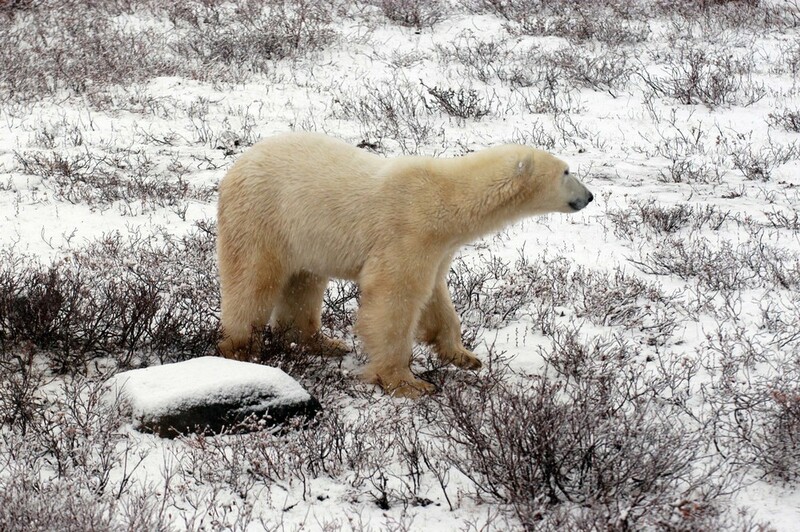 And, of course, Churchill is now known for being something else, thanks to the forward thinking of Churchill residents and Manitoba Conservation, who realized that they could protect humans from the bears and bears from humans, while bringing international tourists into town for a few months every fall during “bear season.” It has become known as the Polar Bear Capital of the World. Signs around the perimeter of Churchill show images of polar bears with warnings not to wander too far out of town limits, but I didn't see any signs warning the bears to stay on their side. This explains why it is impossible to spend even a day in this town without hearing the cautionary tales about hungry bears and their visits through the streets of Churchill, like the one about the unsuspecting resident who had food in his pockets (one of the very few actual human casualties inside city limits) or the recent law banning local children from dressing up during Halloween as walruses, seals, or any other of the bears' preferred prey. My mittens, purchased for my trip, were almost laughed out of town. I had thought them to be uber arctic chic, sort of a Dr Zhivago meets Patagonia, with their fresh white color and small eye-shaped black snaps. "Those mittens look a lot like baby seals." warned a helpful docent at the Eskimo Museum. The serious tone of her voice was enough to cost me $14.95, the price tag on some rather adorable red mittens with the giant maple leaf that is the icon of Canada. "I'm thinking bears don't eat leaves" I said, expecting at least a smile from the woman who was now basking in the certainty that she had saved my life. Still not funny. She was amazed that I had made it through town looking the way I did from behind, as though I was carrying a baby seal in each pocket, without being eaten. Had she taken a better look at my dainty rabbit fur trimmed bots, also more chic than wise, she would have realized that for me, being eaten would have been a painless, quick experience. The streets were so ice covered that had I tried to run away from a bear, I'm certain I would have been flat on my back and knocked unconscious within seconds, my seal pups thrown high in the air, my story remembered as yet another cautionary legend. "Did you hear about the woman from New York who had her arms eaten off in front of the Eskimo Museum?" they would ask. "Oh yes." would be the reply. "and with such beautiful boots." Newly terrified of the out-of-doors, I opted to spend another hour or three safely inside the museum, which turned out to be a wonderful thing. It was there, tacked on a wall next to the giant taxidermied polar bear, that I saw the map that reminded me that I was truly in a different world. I had never seen the earth presented this way, its perspective showed the north pole as the center of the world. Makes sense, now that I saw it. I had no idea that there was so much water, and so much ice. This is a different planet, I thought. A world that knows two different seasons: Frozen and Unfrozen. A closer look revealed that this was one of those magnificent National Geographic Magazine maps, illustrated by a skilled and lucky artist (add to Dream Job List) who had obviously travelled this region (around 1964 according to this map) and created amazing portraits of people and cultures that I was learning of, literally, for the first time. Smiling women with their babies in the hoods of their long fur anoraks, men sitting on the backs of reindeer, one of them using the ample antlers splayed out in front of him as a rack for his enormous rifle. There were sleds and igloos, those were familiar, but there were also shelters and clothing I had never seen. At this apex at the top of the world I could see the close proximity as well as the cultural connection between every northern continent on earth, so much closer than I had imagined them to be, and that was when I felt the earth below my feet change, or maybe it was my understanding of my place on it. How very small I felt, standing there between this map and an 800 pound stuffed polar bear encased in a huge box of thin glass, fangs exposed. And then, pressing my tiny pink hands to the glass alongside it's massive mouth, how very edible. 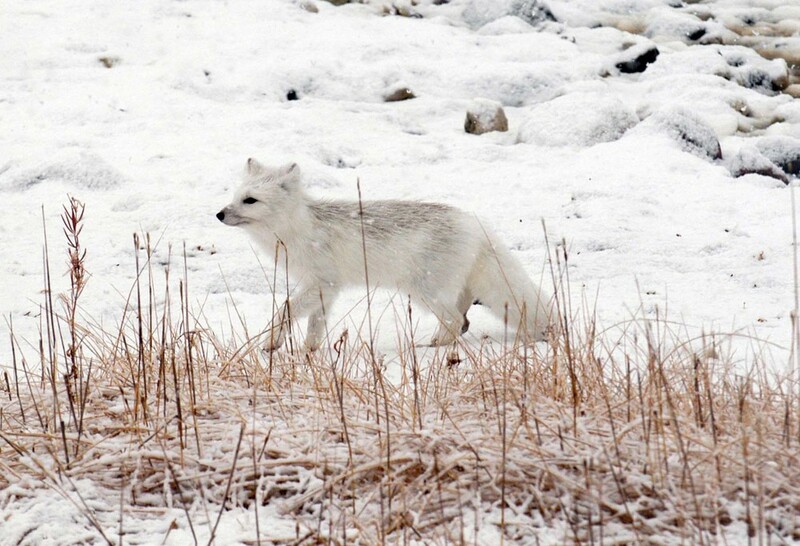 My second day in Churchill was spent as the guest of the impressive Frontiers North, an ecologically minded outfitter represented on our trip by three generations of skilled and professional guides, for whom this place is very familiar territory. 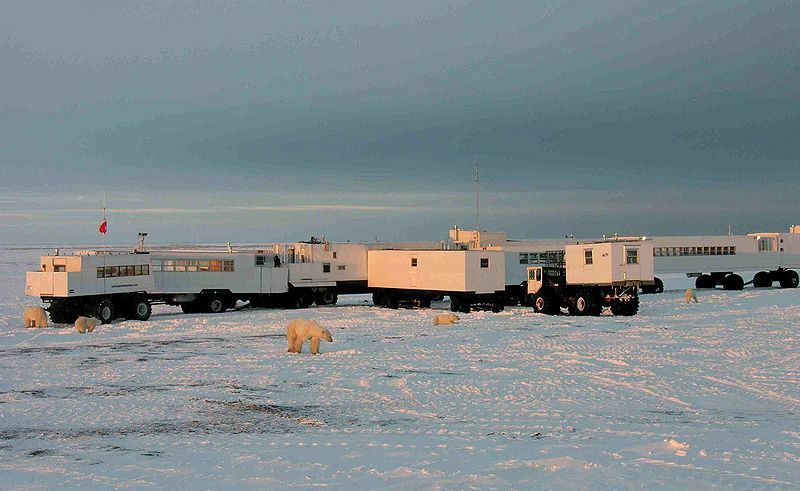 FN has a small fleet of vehicles called Tundra Buggies, built to move across the icy, uneven landscape on enormous tires and with great clearance in order to get far out on the tundra and close to the bears. Respectfully, they limit their movements to specific "roads" in an effort to leave less of a footprint. FN also runs a mobile hotel of sorts, part research station, part photo studio, part bed and breakfast where lucky guests can spend the night. On occasion, special guests including scientists and wildlife photographers including the very talented Daniel Cox provide entertainment in the evenings with slideshows and informative lectures. We would be going out just for the day, in search of bears to watch and photograph. I took my place on the Tundra Buggy with twelve or so other guests including Bill Winhall, assistant curator of mammals at SeaWorld San Diego, who showed me the photos on his iPhone on the long drive over the tundra. Pictures of his grinning four year old were interspersed with images of him, his arms full of an orphaned walrus pup, holding a bottle to its mouth. 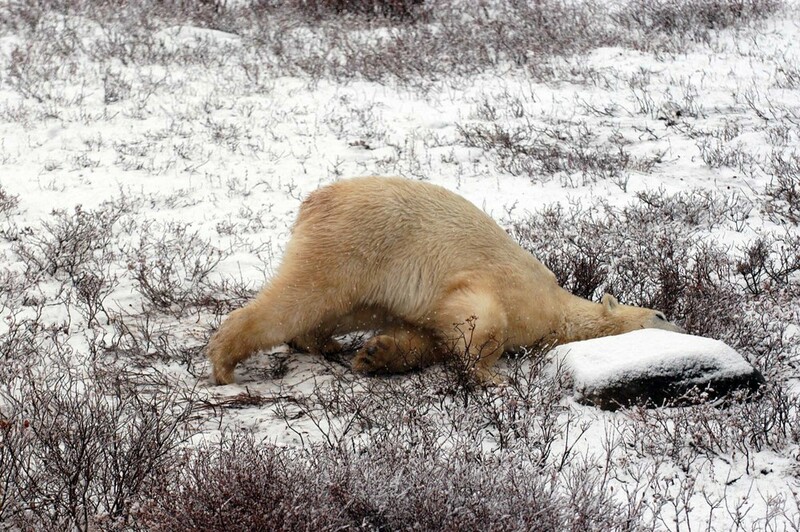 The first bear we saw was asleep, and for the first hour was not responding to our many requests for a better look. Its massive size was difficult to fully comprehend, even when it did finally roll over onto it's back and kick a massive foot into the air. We were a collective bundle of oohs and aaahs, watching it stretch and tumble on the ground, rubbing its neck against the cold ground, stretching and pawing the gravel and ice beneath him. He moved slowly, as though half asleep, like a giant dog having a good dream. Suddenly, just to the left of the bear I saw something small pounce on something smaller. 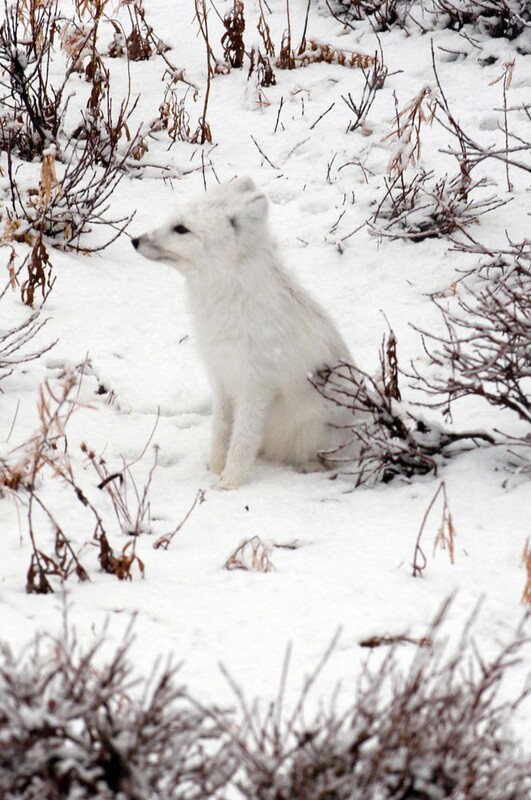 It was a tiny white fox! The bear, which we had been told was likely very hungry, was not fazed. One of our party offered the fox to the bear, as a light snack perhaps. "Eat the FOX!" she shouted, her gloved pointer finger tapping at the glass emphatically "There's some food!" I wasn't so sure that this was something that I should root for, sleepy hungry bear aside, as typically I am in the camp of all things cute, and this fox was certainly insanely cute. The gentleman next to me, who I am sure would rather remain unnamed, sensed my Survival vs Cute quandry and leaned over to quietly tell me his story: "I have been coming here for twenty years. Originally, it was with people who wanted to protect the baby seals. The bears would close in for a kill and they would shout 'shoot the bear!' Now they see the hungry bears and they say 'can't we find them some baby seals to eat??' Maybe we are impatient." Turns out I had nothing to worry about. Foxes aren't afraid of bears, because, for whatever reason, bears don't eat foxes. If they changed their minds they wouldn't have too much trouble, because foxes actually follow bears around hoping for scraps left over from their hunting spoils. The folks at Frontiers North were amazing, knowledgeable and patient, even allowing us to take turns driving the Tundra Buggy for a minute or two each. The vast tundra, with it's sun obscured by clouds and falling snow, looked to me the same in every direction, as far as the eye could see. To our guides, it was a navigable and memorized route with important landmarks. 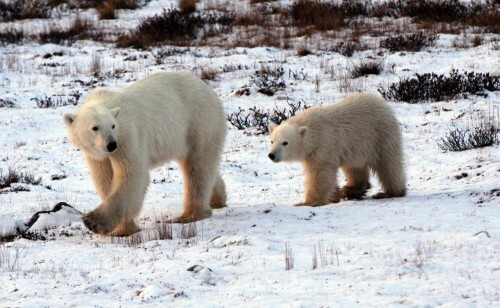 By the end of the day they had expertly steered us into the path of several bears, one of which had two cubs with her. 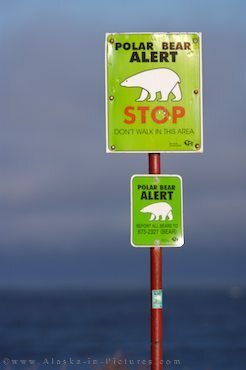 There were moments when we were within several feet of polar bears weighing hundreds of pounds, none of them seemed fearful of our giant vehicle or the flashing cameras. 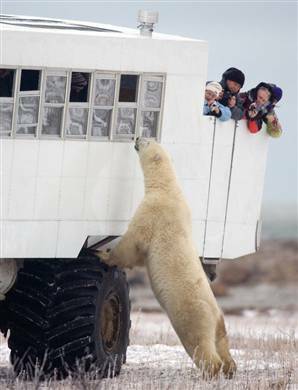 The buggies have viewing platforms that allow you to share space with these bears safely out of reach, but at the same time so close that you could try, at least, to make eye contact. We never left the viewing platforms or touched the ground, which made the tundra seem even more like a moonscape that could not quite support us, which in many ways it was. None of us are built for survival in this climate wihtout a lot of help and support. Living here, in human terms, means an extreme existence. These bears, on the other hand, are engineered for nothing else, and when you see them in their element they are things of pure and heartsopping beauty. We, of course, were seeing them on land, but they are powerful ocean swimmers able to withstand unfathomably cold temperatures, and are able to travel huge distances across frozen bodies of water. Their partner in survival is ice, their great threat is that their once frozen world is quickly disappearing. As we drove home, the sun set against the vast landscape that had seemed just that morning to be barren and harsh. Now I knew it as a system in delicate balance, full of life. I left Churchill the following evening, inspired (and wearing my new pro-canadian non life threatening mittens). 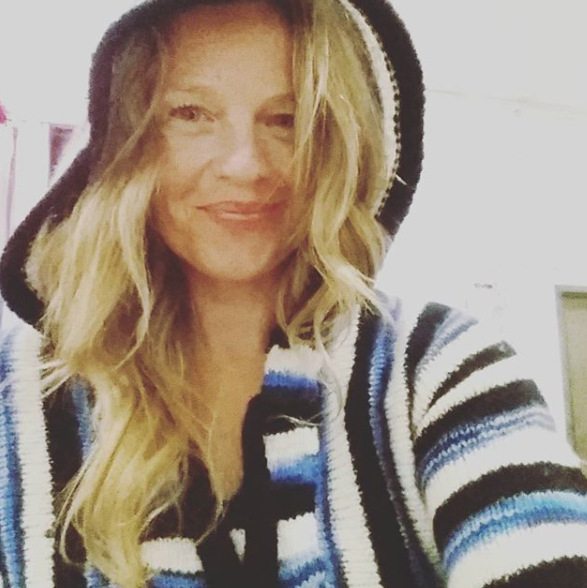 At the airport, waiting for the tiny airplane that would carry us back to Winnepeg, I noticed a young woman dressed in a traditional anorak, her tiny baby peering out from under her hood, strapped to her back. Again, a reminder that there is so much in this world that remains untouched, unchanged, and at least by me, undiscovered. I do hope to go back, or to travel to other arctic places with people who are as dedicated and passionate as the people I met in Churchill. I highly recommend the journey, if you can find a way to make it. If you can't, spend some time on the PBI website, there is so much to learn there. If you are looking for a really fun way to support PBI, have a look at these pajamas I designed for Munki Munki. 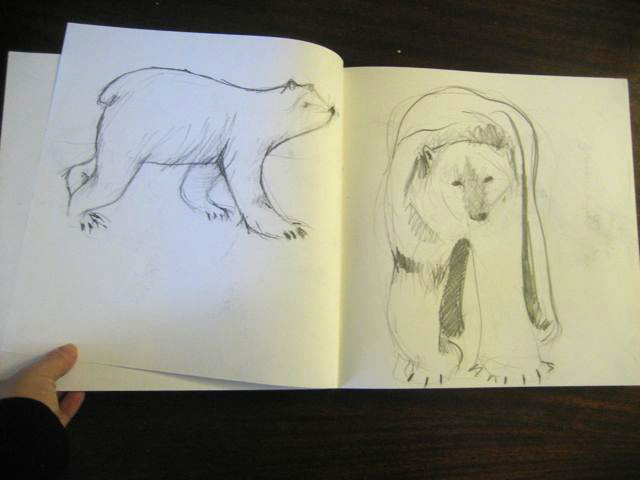 They are covered with the sketches I did while there, along with a few polar bear and arctic fox facts. Munki Munki is generously donating a portion of all sales to PBI. Very Cool Update! I have just gotten an email from Leeann, who is in Churchill now. PBI is carefully tracking the bears movements and activities and putting together some amazing daily video updates. Really lovely: here is the link. And did you know that you or your compnay or school can sponsor an individual bear, and keep track of him as he travels north, thanks to the technology of GPS and tracking devices? Check that out here. note: the photos and illustrations of the bears, foxes, and sunset are by me, the images of Churchill and the tundra buggy are from various sources.